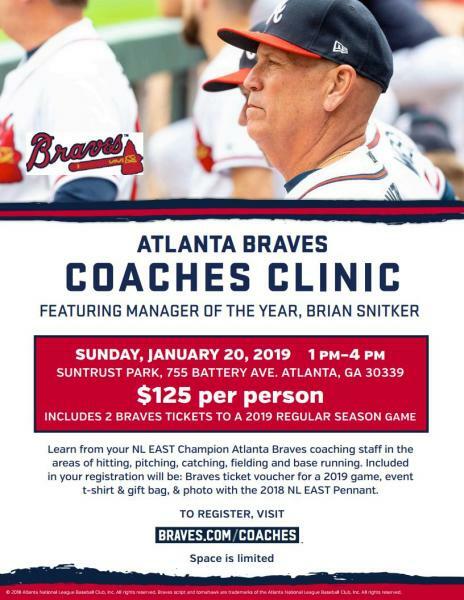 The Atlanta Braves will Host a Coaches Clinic on Sunday, January 20 from 1:00 - 4:00 p.m., at SunTrust Park. Learn from NL EAST Champion Atlanta Braves coaching staff in the areas of hitting, pitching, catching, fielding and base running. Included in your registration will be: Braves ticket voucher for a 2019 game, event t-shirt & gift bag, & photo with the 2018 NL EAST Pennant.